What Is The Best Thing About Using Raised Cat Bowls? » What Is The Best Thing About Using Raised Cat Bowls? Why Use Raised Cat Bowls? ​A raised cat feeding bowl means there is less pressure placed on the cat's joints and muscles as they do not need to crouch down to floor level in order to reach food bowls. This is particularly relevant for senior cats or if your cat has arthritis as it may be painful ​to crouch to reach food. If in pain, your senior cat may tend to eat and drink less and miss out on vital nutrients as a result. Cat owners who have physical mobility issues, will find it considerably easier to pick up a bowl that is raised even several inches from floor level. For some breeds of cats, with flat faces, it can be difficult to access food from a bowl on the floor. Ideally bowls for these kitties will be wider and flatter than usual. The height of the box - The ideal height should be around 4 - 6 inches. Our box is 4” high (see below), but it will depend on the size of your cat. Cats should still be eating in a semi crouch position. How many cats do you have? More than one feeding platform may be required or if the platform has multiple bowls, more that one cat could share the same platform. What is the feeding platform made from? - Will it be easy to clean? This is important. Practicality will win any day. Make sure that it will be easy to wipe down and that the bowls can be easily be removed for cleaning. Can the raised feeding platform be knocked over or easily pushed? Make sure that the platform is not too lightweight​ or your kitty ​may push it around while eating. Can it be easily knocked over by a toddler or a dog? Check the depth of the bowls as this may almost negate the benefit gained from the height aspect. Make sure that the bowls are not too deep. If kitty has to bend his head right into the bowl, the bowls may be too deep. Are the bowls a standard size so that they can be replaced if or when the need arises? As mentioned earlier, if your kitty has a flat face, ensure that the raised cat bowls are reasonably flat and shallow as the raised cat bowl shown below. Sometimes, only sometimes we do actually like the same thing. ​Our senior cat was​ finding it difficult to crouch​ to floor level to reach his food bowls. In addition our hardwood floors made it difficult for him to get any purchase. Once this problem had been identified the solution,​ was to make a raised feeding platform. ​There are many and varied raised feeding platforms ​available ​however with a home handyman in residence it was off to the shed to provide a solution. Kitty walking away. Is he going to like his raised feeding platform? Raised cat food platform ready for action. The end result is a raised box, made from wood and painted white. The top and sides of the box have been ​covered with fiber glass to make it waterproof and easy to wipe clean. As you can see in the photo below, some non slip drawer liner has been cut to fit. As there is a slight raised edge to the box, the bowl cannot be pushed over the edge plus the liner helps to keep the bowl in place. Taking into consideration, the non slip mat underneath the box, the raised edge of the box and the non slip liner in the top of the box it is all extremely stable and doesn’t move at all when being used by kitty. The photo shows that kitty doesn’t have to bend right over to the floor to reach his food and he ​is quite comfortable eating at the new higher level. Also be aware that cats are natural crouch eaters so don’t use a feeding platform that is too high. There are a lot of practical solutions for cat feeding platforms and options to suit all decors. When researching raised cat feeding bowls/platforms, we discovered that despite positive reviews there were instances where a product had been incorrectly packaged and was missing parts rendering the purchase pretty useless. Although this may happen from time to time we think it is unacceptable that this would happen time and time again. Returning a product for 100% refund is reassuring but not the desired outcome when purchasing any item. In addition if a product has been flimsy or prone to mold it has not been reviewed. 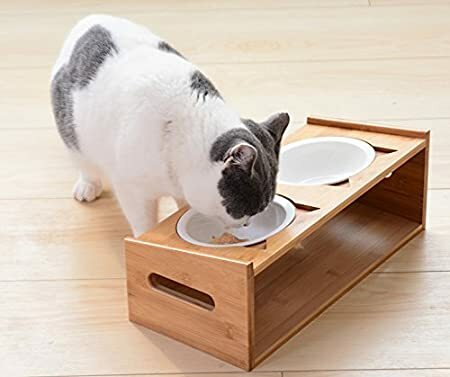 Lepet Elevated Cat Bowls, Raised Pet Feeder Solid Bamboo Stand. Perfect for Cats! Bamboo is such a tough, durable product and yet it is lightweight so when the stand needs to be picked up for cleaning it is lightweight. Although it is lightweight it has plastic stoppers on the bottom and consumers ​ have remarked that even a large cat cannot push the stand around. There are handles on the sides, as can be seen so once again easy to pick up and move to another location. The fact that it has four bowls, two stainless steel and two ceramic is a big bonus. Both sets of bowls are fine to go in the dishwasher and replacement ceramic bowls are available. This stand and bowl will be with you for a long time. It has some very very cute design features. The kitty ears cut out where the bowls are placed is adorable and practical ​making it easy to remove the bowls by using ​a finger to lever and remove the bowl. This is an all round winner and why it is at the top of the list. I have read all the reviews. The LePet sticker (can't be seen in this image) can be peeled off. The product may or may not have a chemical smell when first opened. This product has the choice of a flat feeding area at the top or a slanted feeding area. The slight incline has positive reviews but there is a choice of either. If you​ are keen to read reviews ​there is a link h​​​​ere​. The shorter 4 inch pet feeder shown in the image is the height that is suitable for cats. .Anodizing is an electrochemical process that converts the metal surface into a decorative, durable, corrosion-resistant, anodic oxide finish. It is a highly practical finish for a feeding bowl that is likely to get water and food spills and need cleaning and wiping. The 3 bowls included are US food Grade stainless steel, 2 bowls with a capacity of 3 cups and 1 shallow bowl (1.1", 13 oz). The bowls are also available separately, which is always a good thing. 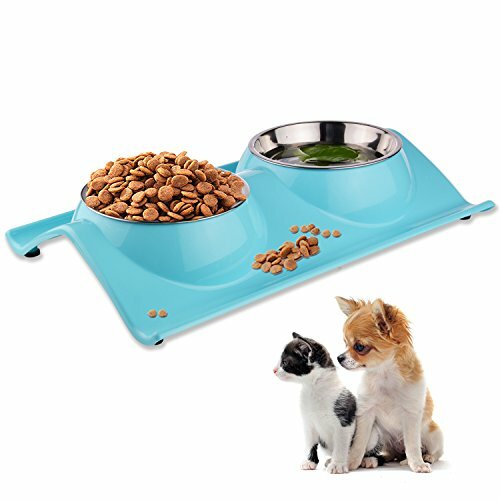 It has anti slip feet and anti slip bowl inserts so the bowl will not be rattling around inside the feeder plus your kitty will not be pushing this pet feeder around the floor. This is definitely a quality product. Easy to clean with a quick wipe and no water spots on the aluminum. This is a link to the most recent up to date reviews ​that includes all reviews, positive and ​critical.​ I have already isolated the reviews that re​late to cats only. Some people have commented on the bowl size for a cat as being large. I have always used this size bowl for the cat and actually prefer to use a bowl that is a little bigger rather than piling up a bowl that is too small. However if your preference is for a shallower bowl, there is always the opportunity to purchase another shallow bowl or use a different bowl with the same circumference dimensions that would fit the unit. As seen in the photo the Neater Feeder has a guard around the rear and the sides of the feeding platform making it ideal for messy eaters. Even the smaller guard at the front will help to contain any wet food or kibble spills. In addition if any liquid is spilled it flows to the front of the feeder where there is​ grate that leads to a catchment area that sits underneath the feeder. So no soggy kibble or canned food mixed with water. This is an excellent design idea. There is space for two bowls so the choice is yours whether it is suitable for water and wet food or wet food and kibble and so on. Many cats prefer to have their water bowl located away from their eating area. Read this review from the owner of a messy eater​. 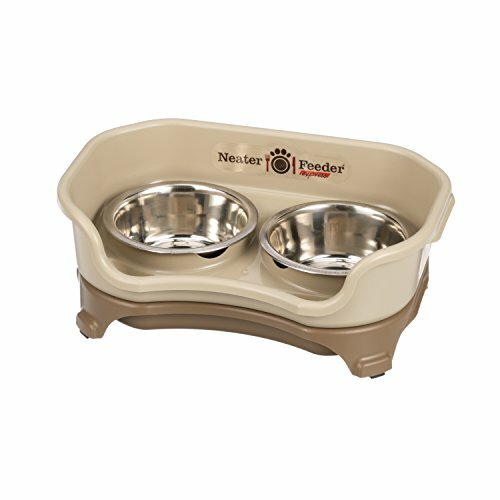 All parts of the product are top shelf dishwasher safe, including the cat bowls and the top and bottom part of the feeder. Some people have commented that this could affect the non slip feet and that it is easy to wash the unit in soapy water when needed. This product is available in different sizes (one size for cats, different sizes for dogs) and colors. It is made in the USA. This elevated feeder has many positive points. It ​has four anti skid buttons to prevent the mat from sliding around. These buttons work very well to keep the mat anchored however consider these points too. ​ In the description these buttons are referred to as an anti skid mat. It is not a 'mat' in the way a mat is usually ​thought of. The mat ​referred to in the description is actually the buttons. The buttons can also be dislodged so be prepared to re glue into place if needed. The platform itself is outstanding. The bowls are easy to lift out and clean as they stainless steel so long lasting - we have stainless steel cat bowls that are years old and still scrub up well. There is a little catch tray for any spills. The colors are gorgeous, green, blue or pink. The description indicates that the base is made from PP resin. The cats are able to access these bowls from all sides quite easily. The bowls are 110z capacity. This is a link to the most recent top reviews which includes photos taken by a consumer so you can see the feeder in action. 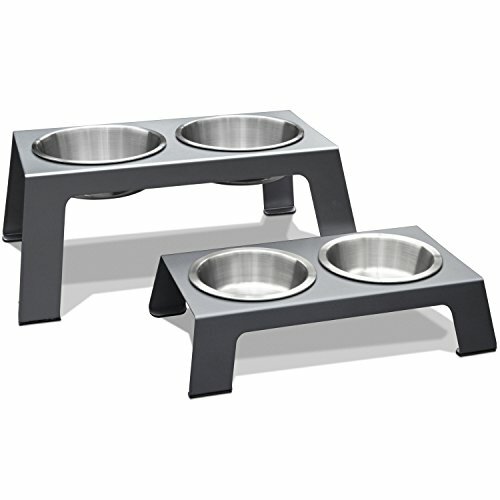 ​In first place and for sturdiness and good design including 4 bowls, two stainless steel and two ceramic, which are replaceable,we choose the LePet Raised Cat Feeder​. It is lightweight but strong, easy to pick up with built in handles​, easy to clean plus it is just right the right height for cats. There are many positive reasons for using raised cat bowls.